﻿There are many dreamed-of and a number of dreamy records which reflect the American idea of freedom from a musical point of view. One of these was presented by frontman Lowell George and his superb group Little Feat in what the musical experts praised as a »symbiosis of anarchistic primitive folklore and rock finesse« (rororo Rocklexikon). The high standard which the musicians maintain over the two sides of the LP is established with "Hi Roller", a funky, energetic opening number. 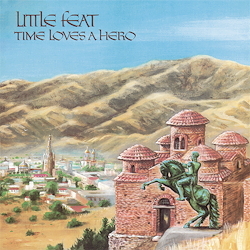 The multi-part title number "Times Loves A Hero" follows on with a more subdued tempo but with great dive and sophisticated percussion, which proves itself to be the most important element and governs the whole album.